This petition has been created by Irish council against blood s. and may not represent the views of the Avaaz community. Irish council against blood s.
Hare coursing is one of Ireland's worst forms of cruelty to animals. Hares are forcefully snatched from the wild, kept in captivity and used as live lures for greyhounds to chase. Hares caught by the dogs are mauled into the ground and thrown into the air. Injuries included broken bones and dislocated hips. 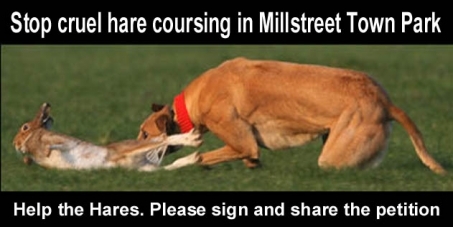 Every coursing season, hares suffer injuries and die as a result of hare coursing activities. Allowing this appalling activity in Millstreet Town Park damages the town's image and undermines its tourism potential.